Opening on Aug. 26 is the love story inspired by the first date of Barack and Michelle Obama. 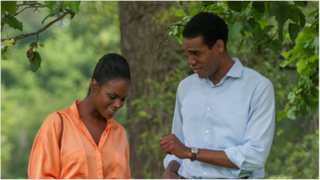 Taking place in 1989, Southside With You stars Tika Sumpter as a young Michelle Robinson and Parker Sawyers as Barack Obama. The couple’s first date was a daylong event that took them from the Art Institute of Chicago to a screening of Spike Lee’s Do the Right Thing to the site of their first kiss outside an ice cream parlor. Take a look at the official trailer below.